Hello, everyone！Since the first long-term release of Ubuntu Kylin 14.04, we’ve received your growing attention on the os. For better user experience, now, we will try to give you a starting point for Ubuntu Kylin operating. Push the power button to power on the monitor and the computer. 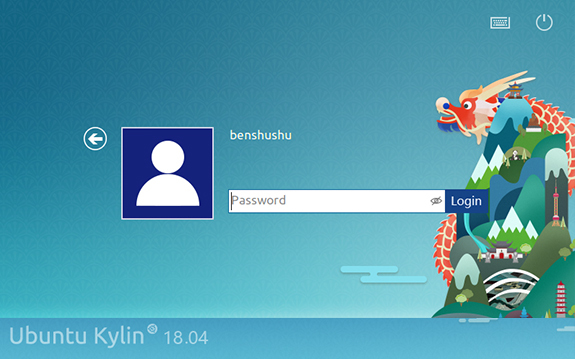 Now, the Ubuntu Kylin login screen comes into view. If you have installed multiple systems, you will first see the grub and choose Ubuntu Kylin to enter it. If you’ve set a password during the installation process, you will be asked for the correct password to login. You can see the picture above. Besides the password box, there are version, onboard, background and power button on the screen. In computer science, desktop is the area of the screen in graphical user interfaces against which icons and windows appear. Ubuntu Kylin team firstly developed UKUI on Ubuntu Kylin 16.10. UKUI is a desktop environment, a continuation of Mate. It is under active development to add support for brand new start menu, control center, panel, themes and icons while enhancing your desktop experience. Desktop background is a picture on your desktop. Every wallpaper in Ubuntu Kylin is delicate and pretty. Besides several well-designed wallpapers, we also pick some pictures from users’ contributions. The wallpaper can be adjusted by various sizes and resolutions, such as 1024x768, 1440x900, 1366x768, 1280x800 and so on. Right-click the desktop, then select “Change desktop background” to choose a picture worthy of gracing your desktop background. The icons are used in the panel menu, and in nautilus and other applications, to represent the different applications, files, directories, and devices. By setting the shortcut, you can open the application rapidly. How to add and delete the icons? 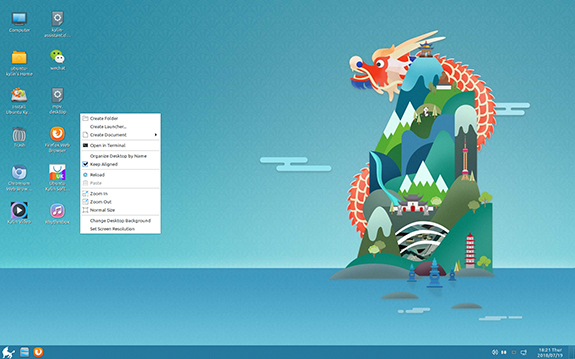 First, you can drag the application directly from the start menu or panel to the desktop. And then, click and choose a icon on the desktop and press the Delete button. 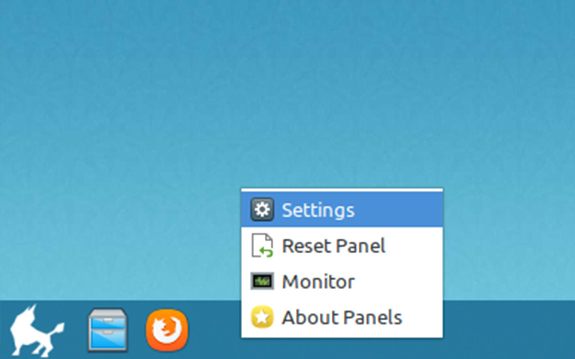 The most remarkable feature of Ubuntu Kylin 18.04 is the panel, on the bottom of the screen with applets such as a Menu Bar, Taskbar, Notification Area and Clock. 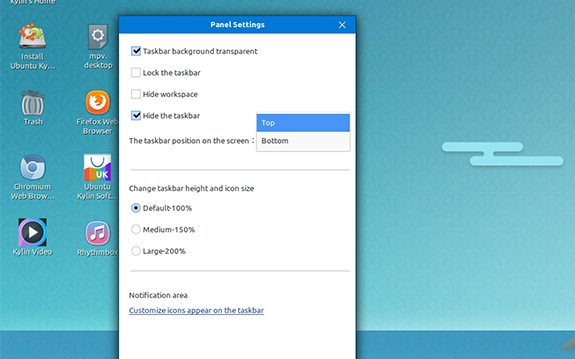 To cater to the needs of China users, Ubuntu Kylin combines former upper and left panels into the bottom one. 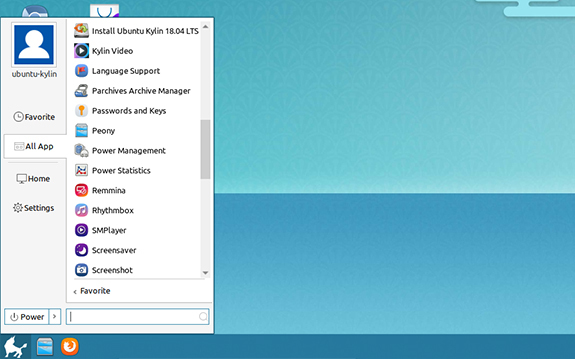 Start menu is on the left-bottom of the screen and uses Ubuntu kylin’s icon. It can search and start your programs quickly and make your work comfortable. You can open it by pressing super button. Ok, it’s time to say goodbye. But you can still enjoy the system after reading the article. Remember to save important applications and documents before shutting down the computer. 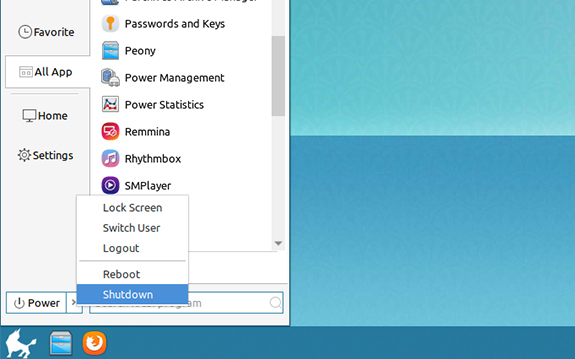 Then, you can click Start Menu – Shutdown and select Shutdown. Also, you can enter shutdown in the terminal. Previous：Ubuntu Kylin Team Building Activity Held Successfully in Changsha! Next：Dean Liao Xiangke has made a prestigious cut in China Open Source’s Leads!